El Nino conditions in the Monterey Bay area this winter are predicted to bring above average rainfall, which can come in drenching rains that flood and waterlog soils for extended periods. At the same time, winter air temperatures are predicted to be warmer than normal and consequently soil temperatures will be too. So, what impact might this have on plant diseases? At least one important group of plant pathogens that cause crown and root rots might be favored by these conditions. 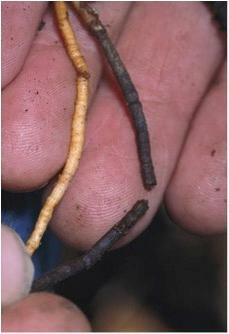 Phytophthora (pronounced fy-TOFF-thora) are fungus-like pathogens that develop particularly well in warm and moist soils. During rain downpours, infested soil or spores can move in water runoff. Flooded soils promote spore production and predispose plants to infection. Unfortunately, there is little that can be done once plants are infected but there are practices that can be done to prevent these diseases. Phytophthora cause crown and root rot diseases of herbaceous and woody plants. Almost all fruit and ornamental trees and shrubs (including many California natives) can develop Phytophthora crown rot if soil around the base of the plant remains wet for prolonged periods or when planted too deeply. Tomatoes, peppers, eggplant, and other vegetable crops can also be affected by Phytophthora root rot. In trees and shrubs, the pathogen kills plants by growing from the roots up through the root crown and into the lower trunk, where it kills the inner bark and causes a browning of the outer layer of sapwood. In many of these crops, different species of Phytophthora can be involved. The leaves of plants affected by Phytophthora rot can appear drought stressed. Trees or plants often wilt and die rapidly with the first warm weather of the season. Leaves may turn dull green, yellow, or in some cases red or purplish. 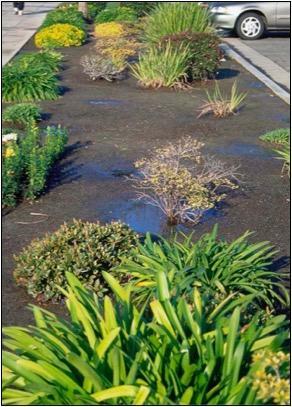 Often only plants in the most poorly drained area of the landscape or garden are affected. Phytophthora infections typically kill young trees, because their root systems and crown areas are small compared to those of mature trees. 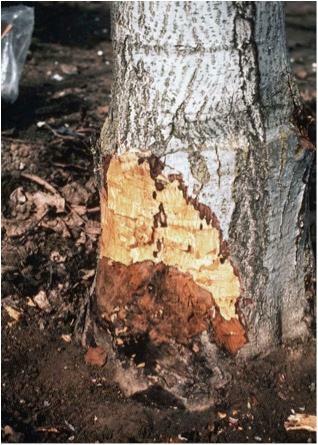 Above-ground symptoms may develop first on one branch or stem then spread to the rest of a tree or plant. Trees may decline over a period of years before finally dying or they may be killed in a single season. Slow decline occurs when the roots are attacked; rapid decline occurs when the crown or basal stem is attacked and girdled. Practices that prevent Phytophthora diseases should have started well before the upcoming El Nino because there are usually no curative treatments. For example, there are no fungicides that cure the disease. Start by reducing the threat of Phytophthora rot with good water management. 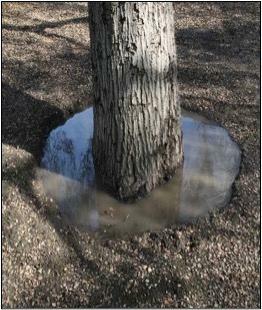 Avoid prolonged saturation of the soil or standing water around the base of trees or other susceptible plants. Irrigate only as much and as often as necessary. If you irrigate trees with sprinklers, use low-angle sprinkler heads and splitters to avoid wetting the trunk and lower branches. If using a drip system, place the emitters at least a foot away from the trunk. Do not install irrigated turf around the base of trees, remove all weeds, and do not water the crown area directly. Group plants according to their irrigation needs. Separate those needing frequent, light irrigations, such as potatoes and strawberries, from those needing infrequent, deep irrigations, such as tomatoes and melons. It may be possible to slow the spread of Phytophthora within a landscape by avoiding movement of infested soil, water, and plant parts from an area where Phytophthora rot has developed. If the landscape or garden allows drainage water to flow from infested to uninfected areas during wet weather, consider putting in drains to channel the water away from healthy plants. Boots and tools with clinging infested soil can move Phytophthora to unaffected areas too. Avoid planting susceptible species on poorly drained or shallow soils. Provide adequate drainage by breaking through soil compaction and hardpan. In poorly drained soils, or in an area where you know Phytophthora is present, consider planting trees and shrubs on mounds. The mounds should be 8 to 10 inches high. Planting depth after settling should be no deeper than in the original nursery pot, with the upper roots near the soil level and the graft union well above the soil line. At the first signs of aboveground symptoms, examine the tree at the soil line for crown rot. If crown rot is present, remove any soil from the base of the tree down to the top of the main roots and allowing the crown tissue to dry out. Carefully cut away bark that looks affected and expose the underlying affected sapwood to air.